Vintage ZODIAC Red Dot Quartz Automatic Professional Diver 200m TwoTone, Works! Vintage Zodiac Red Dot quartz 200m watch New Old Stock. Leather strap. New!!! 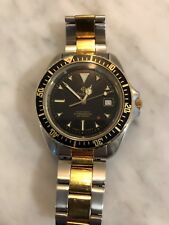 ZODIAC Sea Dragon 1882*Model zo2901*Used watch*watch runs. This page was last updated: 23-Apr 14:56. Number of bids and bid amounts may be slightly out of date. See each listing for international shipping options and costs.